Uranus has relative feartures in its apperance at visible wavelenghths. Even from Voyager 2 at a distance of 80,000 km there were few features. the brightest picture of the two new moons of Uranus. It name for know is S/1997 U 2 until they come up with a name for the satilite. Notice the circle motion of the moon to the background stars. The images were taken roughly one hour apart on September 7, 1997. A faint asteroid in the main belt may also be observed and identified by its much faster rate of motion. This picture is a picture of Uranuses new two moons. It is known as S/1997 U 1 until the International Asronomical Union (also known as LAU ) comes up with a name for the satellite. The glare from Uranus, which is not pictured in this picture because it avoid saturating the detector, is visible at the right. This diagram shows the position of the moons relative to Uranus. Uranus is shown at the center of the picture. The circular orbits of the outermost two previously known moons (Titania and Oberon) surround the planet, and appear as ellipses because the orbits viewed from Earth are somewhat edge on. The four search fields for the discovery observations of September 6 and 7 surround the planet, each box shows one shot that was taken. The fainter moon was discovered almost directly east of the planet. The brighter moon was northwest at the time it was discoverd. The arcs that the satellites followed after discovery are shown, corresponding to the preliminary fits to the orbits of the moons, calculated by Brian Marsden of the Minor Planet Center at Harvard University. Artist's impression of Voyager 2 and Uranus. Recently there has been two new moons and rings discovered orbiting around Uranus. Uranus has a total of 21 moons the 5 that are pictured above are the largest of the 21 moons the others re much smaller. How Many Moons Does It Have? Uranus has at least fifteen moons. There are probably more, but this won't be known for sure until another spacecraft is sent to investigate. 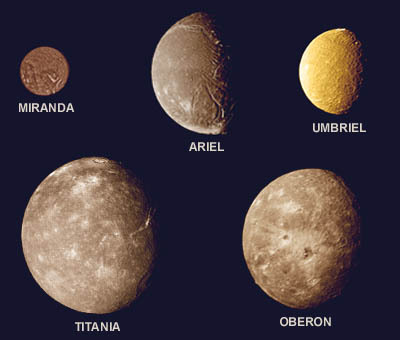 The largest, and furthest away, of Uranus' moons are Miranda, Ariel, Umbriel, Titania and Oberon. The moons are named after characters in the stories of William Shakespeare and Alexander Pope. The remaining ten moons are much smaller and a lot closer to the planet. They were discovered by the Voyager 2 spacecraft as it sped past the planet in 1986. Some of the smaller moons act as "shepherds", helping to keep some order in some of the rings. 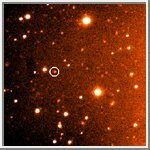 The others may be comets or asteroids that have been "captured" by the planet. All the gas planets have rings, but the rings of Uranus are a very faint. The rings cannot be seen from Earth but the Voyager spacecraft showed them. Astronomers get a hint of the rings when they occasionally block the light of a star behind them. Even the Hubble Space Telescope cannot get a very good view of the rings. While the rings of Saturn are made up of fairly small pieces of bright white ices, the rings of Uranus seem to be made of larger chunks of very dark, rocky material. The darkness of the chunks may help explain why they cannot be seen from Earth.